Can anyone, much less Maria, stop Serena? This is almost impossible, isn’t it? Maria Sharapova is 2-16 against Serena Williams? Clearly, Williams has been better since Sharapova won 46 62 64 at the 2004 WTA Tour Championships and the match before, Maria’s first Slam crown at that year’s Wimbledon. But Williams fought off a couple amazing points, grabbed the semis and won the 2005 Australian Open. After that, Serena knew that she could out hit her. Sharapova wasn’t sure how she overpowered Williams in those early matches. From then on, she could not, losing in all sorts of places. One cold fact: Sharapova lost her confidence when playing Williams. She has not been consistent against Serena, who does not like Maria very much and she wants to beat her pants off every time out. The Russian/LA player has to play as well she can, and even better. Serena has a substantial first serve, and even her second serve is dangerous. She is a little faster and is more accurate her volley, too. But Sharapova is right there with her forehands and backhands, as she hits just as hard as she can. When she is on fire, she might be a bit better smoking the down the line. But, in order to get there, Sharapova is going to have to lock in immediately. She has to hold serve time after time and not panic. Once she is in her rallies, she is fine, but if she cannot return better and serve well herself, she is in deep trouble. Someday, Sharapova will upset her and grab a win. But Maria is 27 years old and Serena is 33 and they both are thinking about how long they will continue. Beyond the 2016 Olympics, they may wave goodbye. Whatever the case, Sharapova and Williams are in the final at the Australian Open. This time, Maria will play better; she won’t go nutty early on and allow Serena to push her to the wall. 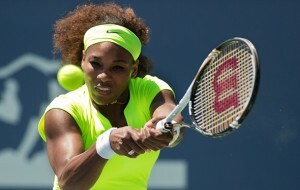 But in the end, Serena will win again, this time in three dramatic sets. The evening will be terrific final and maybe, just maybe, they can give each other a big hug. Perhaps not, but at least they can give each a big cheer. After all, they are great champions who are proud, right?